Coarsely grate courgette onto a clean teatowel, pull up the sides of the teatowel and twist and squeeze tightly over the sink to remove as much liquid as possible. Mix egg and flour to make a very thick, smooth batter. Add grated courgette, feta, spring onion or chives, garlic, mint, lemon juice, chilli flakes and salt and pepper to taste and stir well. Melt butter in a heavy-based frypan then tip the melted butter in to the batter (very important) and stir until evenly combined. Use this same pan without washing to cook fritters. Spoon mixture into hot pan, using about 2 tbsp for each fritter to make 4 medium-sized fritters. Flatten slightly. 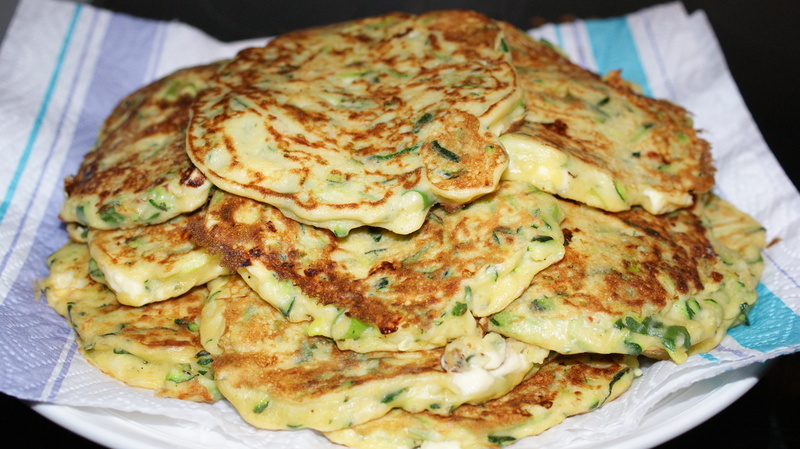 Cook fritters over medium heat for 2-3 minutes on each side or until mixture is fully cooked through to the centre. Serve with salad leaves and lemon wedges. 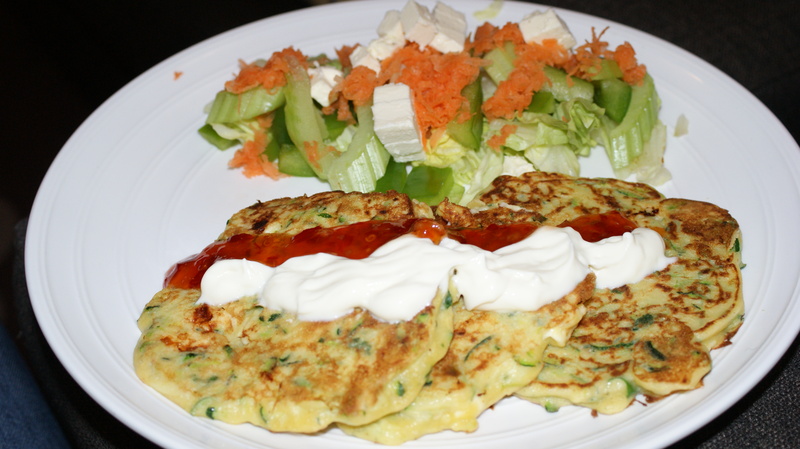 I prefer salad, and some Thai chilli sauce and sour cream drizzled over the fritters. I leave the mint out as it can be quite over powering, and use chives and spring onion. You can also add mushrooms or sun-dried tomatoes to mix and match if making them regularly. Have to say thanks to Annabel Langbein and her Free Range in the City cook book. She’s the Kiwi equivalent of Nigella Lawson, but without the sexualized food tasting. Guess when you read the book you don’t really notice though. So this is the first photo for September Snaps. What we have here is the ingrediants all ready for making soup. Here’s the recipe for anyone interested in making it. Add butter or oil and onions in a large saucepan, heat onions until they are transparent. Add curry powder, coriander and chilli powder (as much as you like for hotness) and stir over a moderate heat for about a minute. 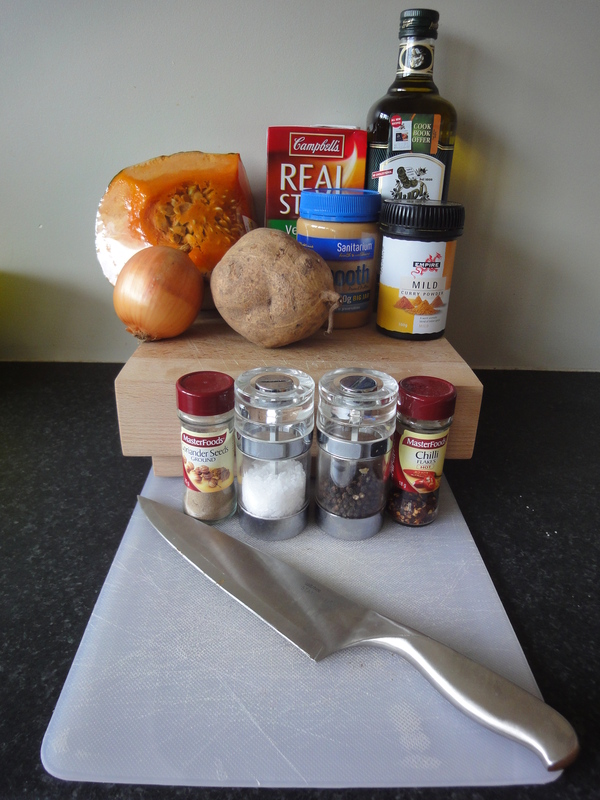 Peel the kumara and pumpkin and chop the flesh into 1 cm (1/2 in) cubes. 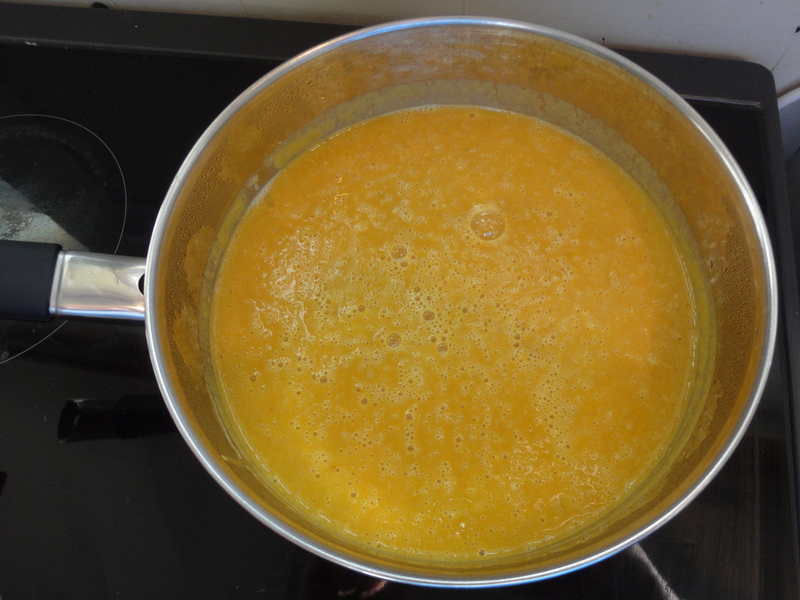 (Do not use more kumara or the soup will be too sweet). Add the vegetables to the pot with the stock, bring to the boil and simmer for 15 minutes or until the vegetables are tender. Add the salt then peanut butter. (Too much overpowers the vegetables). Puree in a food processor, blender or mouli (or us a potato masher). Adjust the seasonings and reheat. Serve topped with a swirl of yoghurt or coconut cream, or with a few finely chopped roasted peanuts. This actually always tastes better the day after (or week since it makes about 3 litres). So if you can I recommend making it the day before you want it. Tough I know as it smells and tastes really good! … and this is the end result!